The founder of Aldridge Gardens, Eddie Aldrige, with wife Kay, above, reflects on family, business, discovery of the Snowflake hydrangea, the garden’s annual fundraiser “Hydrangeas Under the Stars” and more. Journal photo by Maury Wald. Eddie Aldridge was on a tour bus heading into Canada’s famous Butchart Gardens several years ago when he gave his fellow passengers a bit of a jolt. “I started screaming because there at the entrance to the gardens were our plants,” he said, smiling at the memory. The plants that so delighted him were Snowflake hydrangeas. Thanks to Aldridge and his father, both noted nurserymen in the Birmingham area, the Deep South shrub with its intricate blossoms now brightens gardens around the world. Snowflake hydrangeas are the signature plant at Aldridge Gardens, a 30-acre public garden that’s an oasis of serenity in bustling Hoover. But it was another plant that was the seed of Aldridge’s idea for the garden. In the 1960s, he had planted two magnolia trees on what was then the Coxe family estate in Hoover. He’d been struck by the natural beauty of the property and, when he found out years later that the land was for sale, took his father along for a closer look. Eddie Aldridge bought the property in 1978, but not with- out overcoming some obstacles. “A company was going to buy the property and build 380 apartments on it,” he said. Those plans fell through when Jefferson County declared a moratorium on sewer connections, and the price of the property dropped from $900,000 to $425,000. Part of his purchase included the Coxes’ house, which was designed by Birmingham architect Henry Sprott Long. Aldridge wasn’t sure he needed such a large home because he was unmarried at the time. That changed when in 1981 some friends brought a pretty young woman named Kay Shackelford Rockett to his house for dinner. Kay Aldridge said she didn’t know much about plants when she and Eddie married. Aldridge said his wife did a “great job” with the garden shop. “She was a natural,” he said. The couple lived in the Hoover house until 1995, when they reached an agreement with the city of Hoover that allowed Aldridge Gardens to become a reality. They took the same architectural plans that had been used for the Hoover house and built an almost identical home in the Highlands Lake neighborhood in North Shelby County. Behind the lakeside house is a bank of Snowflake hydrangeas. The deck is dotted with colorful potted plants, including some planted in a Radio Flyer wagon from 1933, the year Eddie Aldridge was born. Fountains add the peaceful sound of rushing water. “Some of those things that Eddie planted have gotten too big or have grown together,” Kay Aldridge said, adding that she’s part of a “committee of two” that makes decisions about garden maintenance. The other member of the “committee” is her experienced helper, Tommy Eakin. His dad, Walter Eakin, started working in the Aldridge family’s greenhouses in about 1950. In the house’s spacious den is a framed photo of a Southern Living magazine cover featuring the Snowflake hydrangea. The photo was a gift from John Floyd, the magazine’s former editor, and it’s a daily reminder of the plant whose story Eddie Aldridge loves to tell. 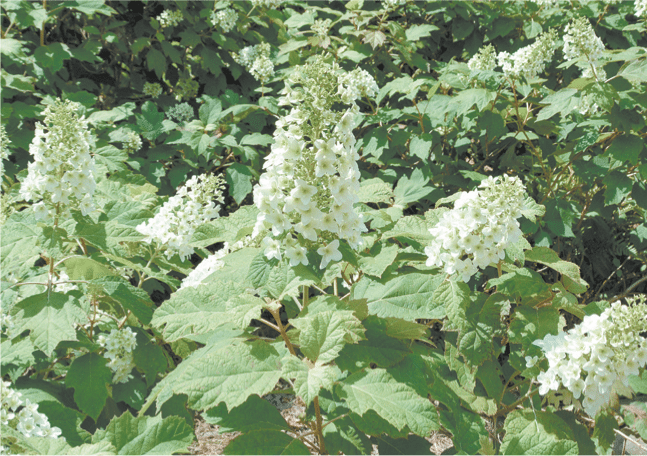 Snowflake hydrangeas, left, are the signature plant at Aldridge Gardens, a 30-acre public garden that’s an oasis of serenity in bustling Hoover. But it was another plant that was the seed of Aldridge’s idea for the gar- den. 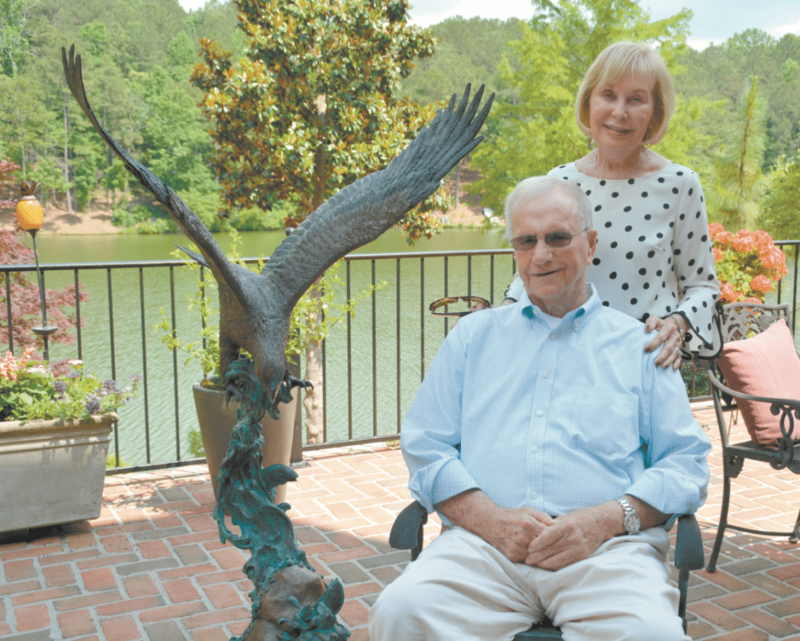 Above, Eddie and Kay Aldridge enjoy spending time outdoors at their home in Highland Lakes. “One day, Mr. Bobo, a man I rode to school with, brought a plant over to us and asked what it was,” Aldridge said. “I thought, “My God! This is an oakleaf hydrangea.’ But I’d never seen anything like it. What makes it unusual are its multiple blooms, which makes it look like a snowflake. The Aldridges propagated and then patented the plant – but not for profit. Today, the Snowflake hydrangea is Alabama’s official state wildflower. It’s also spread far beyond the Alabama woodlands. “New York is full of them,” Aldridge said. “In the early 1980s, New York City bought 2,000 5-year-old plants from our farm. They’re in Central Park and at the New York Botanical Garden. At age 84, Aldridge still serves on the Aldridge Gardens board of directors. “I try to go to the gardens almost every Saturday just to visit with people,” he said. “We were lucky to find her,” he said. Kay Aldridge said Lynch has been instrumental in the growing success of Hydrangeas Under the Stars, the garden’s annual fundraiser. It’s set this year for June 9. Eddie Aldridge said one of the nicest things that’s happened to him recently was being inducted, along with his father, into Auburn University College of Agriculture’s Hall of Honor in 2017. The civic-minded Aldridges have set up several trusts, including one that benefits Auburn University, Samford University, the University of Alabama at Birmingham and Birmingham-Southern College. Eddie Aldridge graduated from Birmingham-Southern; his older brother died shortly after graduating from Auburn. In 2009, Eddie Aldridge wrote a book called “A Garden of Destiny.” It preserves for posterity the remarkable story of how a young man’s dream came into full flower. Because of Aldridge’s foresight, the gardens will continue to bloom in the future. A measure doing just that passed the Hoover council despite opposition from two council members, Aldridge said. Hydrangeas Under the Stars will be from 6 p.m. to 9 p.m. June 9 at Aldridge Gardens. The garden gala includes food, entertainment and live and silent auctions. The event is Aldridge Gardens’ major fundraiser. It raises money not only to help keep the gardens beautiful, but for educational programs, camps and field trips for the thousands of children who visit every year. For more information, visit aldridgegardens.com.